Dogs are born with a lot of natural instincts. Given the fact that there is a swimming style we all know as the “doggie paddle,” wouldn’t it make sense that swimming was one of these natural instincts? Most dogs, if held above water, will automatically start their doggie paddle in the air. They see water and their legs start cranking in that familiar, peddling motion. Seems like all you need to do is drop them in and watch them go. 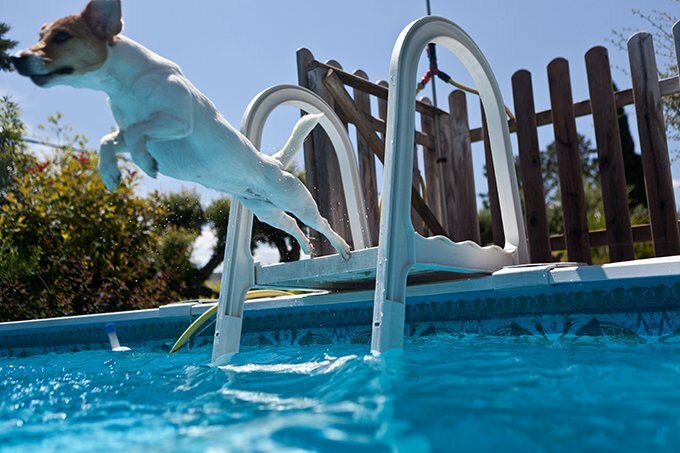 A lot of people believe that all dogs are born with the ability to swim instinctively. It can be a deadly misconception. Turns out there are three types of dogs: those who can swim, those who can swim but are terrified of water, and those that have a unique ability of sinking like a rock in any aqueous situation. Certain dogs were bred for water rescue and activity. These breeds usually are not only excellent swimmers, but they tend to thoroughly enjoy the water as well. Water loving breeds include Retrievers and Spaniels, such as the Labrador Retriever, Golden Retriever, the American Water Spaniel, Irish Water Spaniel, and the Portuguese Water Dog. Retrievers and Spaniels tend to have strong, long, hind legs, which are excellent for swimming. Other dogs may have the innate ability to swim, but that does not necessarily mean they are safe in the water or able to keep themselves afloat. Some of the aforementioned breeds may fall into this category, despite their physical abilities. Smaller breeds, such as Chihuahuas and the Maltese, for example, have the ability to swim, but may quickly become overwhelmed by the vastness of the water. If overwhelmed, these types of dogs will tire themselves out too quickly. They may also panic and try desperately to climb anything – including you – to get out of the water. If you have a dog who has the physical ability to swim but not the nerve to back it up, you can slowly introduce them to the idea of swimming. You can try encouraging your dog by going into a swallow part of the water and seeing if your dog follows. Reward your dog with treats for every new benchmark she makes in the water, even if it is simply getting her paws wet. 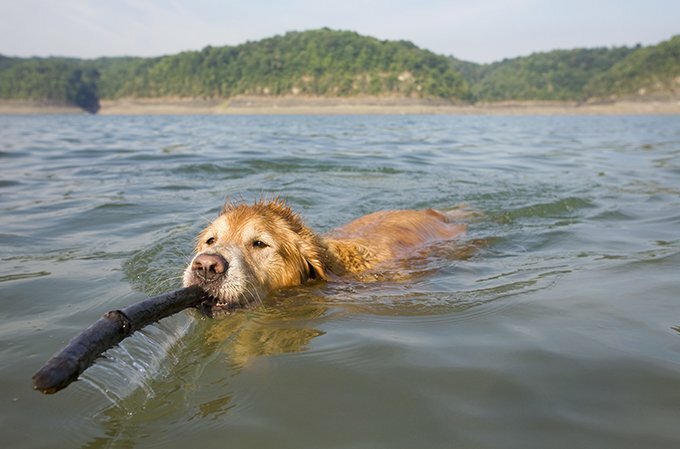 As your dog gets more comfortable with the water, she will be more at ease to swim in deeper areas. 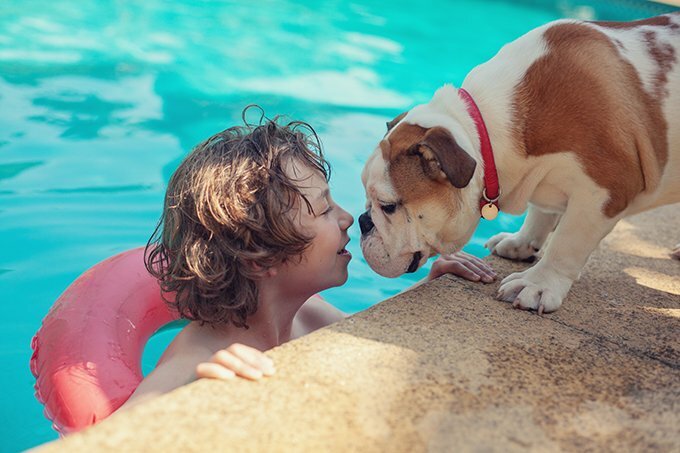 Being with another dog that loves swimming may also encourage your apprehensive pup to adventure into the water. Then there are the dogs that try as they might, just aren’t built for H20. Breeds with large, boxy chests, shorter hind legs, and/or short muzzles often do not fare well in swimming scenarios. These types of breeds include Boxers, Pugs, Basset Hounds, and, most notoriously, the Bulldog. Any breed with a short snout, or brachycephalic breeds, may also have difficulty breathing or keeping their airways above water. All of these breeds should be under constant supervision near any body of water. This is not to say that these types of dogs cannot enjoy a beach day with the family. Non-swimming breeds can still enjoy some fun on the beach in the shallower areas of the water, and may even enjoy lounging on a large floaty with you in the pool! Just be sure that your dog is not anxious and will not abort ship and endanger his life. It goes without saying, but even if your dog has the swimming prowess of Michael Phelps, that doesn’t mean you shouldn’t take safety precautions. Invest in some doggie swim gear, such as dog life vest and booties if you are in a lake or area with jagged edges and hot sand, and be sure to always have someone with a dog who is swimming in water. Keep clean drinking water available and a nice shady area for your dog to relax in after any water sporting activity.